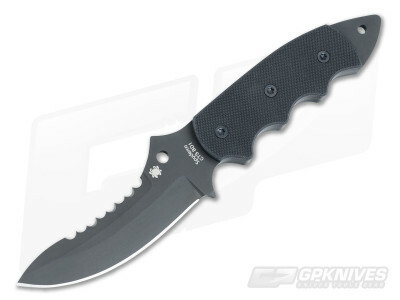 The Spyderco Pygmy Warrior fixed blade combat knife is a compact and easy to carry design by Bob Taylor, a combat veteran and martial artist, based off of the storied Warrior blade. Known for its superior edge retention, the Pygmy Warrior is constructed of a thick full tang of vacuum melted CTS-BD1 stainless steel. The blade naturally curves to match to arc of motion of the human arm and allowing for optimal energy transfer while minimizing fatigue. Aggressive spine serrations help to provide traction when using reverse grip techniques. Stackable G10 handle scales and spacers allow for the end user to customize the grip to his/her hand by removing one or both of the slabs. Includes a molded Bolatron sheath with G-Clip attachment for a multitude of carry options. Also includes a copy of the book The Warrior Path, which outlines the history and evolution of the Warrior knife. Brand new directly from Spyderco Knives.